Last time, it was the House Republicans – with Mike Kelly providing the inspirational locker-room speech – using the nation's debt ceiling and economic viability as a hostage, now it's the government itself. In case you've been going about your day-to-day business – watching the incredibly dramatic final week of baseball, say, or hanging onto every moment of "Breaking Bad" (and I won't mention the Steelers) – you've probably missed the crazy wrangling in Congress around the Affordable Care Act (ACA), the debt ceiling, and a government shutdown. It's a mess. The procedures that are at stake here are complicated and confusing, but the easiest way to explain what's going on is that Congress needs to pass a resolution so that the government can continuing operating – and that House Republicans refuse to pass any kind of funding bill unless the ACA is defunded or delayed. Is the ACA perfect? Hell, no. Back in 2010 when this thing passed, I recorded my ambivalence. Much of it has come to pass. The law helps some people out, hurts others, and doesn't do much to fix a broken health care delivery system – but more people will have access to health care, and that's not nothing. The ACA is a first step. Opposition to it from the right has been…well…a little unhinged, to say the least. One reprehensible conservative canard is the depiction of "Obamacare" as a kind of government insurance program that no one wants to sign up for – when the law is really creating a "marketplace" for competing private insurance plans. That is, you don't have to give up your existing benefits. And sometimes conservative rhetoric gets downright silly. Whatever. Even with the legitimate concerns about the ACA, the bill represents positive change from the status quo. Obamacare and the Affordable Care Act are obviously the same thing, but they have different favorability ratings. CNBC's third-quarter All-American Economic Survey asked 812 respondents what they thought of Obamacare and what they thought of the Affordable Care Act. Nearly one third of respondents did not know what the Affordable Care Act is, compared to only 12% who didn't know what Obamacare is — which probably reflects the more popular usage of the term "Obamacare" than "Affordable Care Act." The positives and negatives of the law rise when it is called "Obamacare" as opposed to the "Affordable Care Act." The survey concluded that 46% of respondents oppose Obamacare, while only 37% oppose the Affordable Care Act. Similarly, the positive approval rating of the law jumps 7 points from 22-29% when it is called Obamacare. The rest of the respondents were unsure. When Obama's name is attached to health care, people's personal opinions of Obama himself are likely to skew their perception of the law. In other words, Republicans and Democrats react pretty much like you'd expect. So now what? Now, a core group of Republicans is threatening to shut down the federal government over the ACA. And Erie's House Representative, Mike Kelly, is among them. As Paul Krugman explains, past government shutdowns didn't result in catastrophe, they were more of a "major nuisance" but led to "no lasting harm." 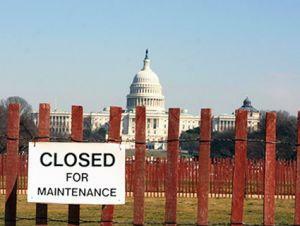 ...it's important to note that the Clinton-era shutdowns took place against the background of a booming economy. Today we have a weak economy, with falling government spending one main cause of that weakness. A shutdown would amount to a further economic hit, which could become a big deal if the shutdown went on for a long time. And that's a big deal, especially for a place like Erie, already suffering from poverty and joblessness. Why? Financial markets have long treated U.S. bonds as the ultimate safe asset; the assumption that America will always honor its debts is the bedrock on which the world financial system rests. In particular, Treasury bills — short-term U.S. bonds — are what investors demand when they want absolutely solid collateral against loans. Treasury bills are so essential for this role that in times of severe stress they sometimes pay slightly negative interest rates — that is, they're treated as being better than cash. Now suppose it became clear that U.S. bonds weren't safe, that America couldn't be counted on to honor its debts after all. Suddenly, the whole system would be disrupted. Maybe, if we were lucky, financial institutions would quickly cobble together alternative arrangements. But it looks quite possible that default would create a huge financial crisis, dwarfing the crisis set off by the failure of Lehman Brothers five years ago. "No sane political system would run this kind of risk," writes Krugman. "But we don't have a sane political system." This time, the fight that matters is within the Republican party, and that fight is over whether compromise itself is legitimate. Outsiders to this struggle -- the president and his administration, Democratic legislators as a group, voters or "opinion leaders" outside the generally safe districts that elected the new House majority -- have essentially no leverage over the outcome. I can't recall any situation like this in my own experience, and the only even-approximate historic parallel (with obvious differences) is the inability of Northern/free-state opinion to affect the debate within the slave-state South from the 1840s onward. Nor is there a conceivable "compromise" the Democrats could offer that would placate the other side. ...[T]he...suicide-caucus members live in places where the national election results seem like an anomaly. Obama defeated Romney by four points nationally. But in the eighty suicide-caucus districts, Obama lost to Romney by an average of twenty-three points. The Republican members themselves did even better. In these eighty districts, the average margin of victory for the Republican candidate was thirty-four points. According to Fallows, the suicide caucus represents 18 percent of the House and a third of House Republicans. Its members also received just 12 percent of the 2012 votes cast for the House and represent 18 percent of the nation's population. It's a minority of the Republican Party that has driven the whole GOP off the tracks, the leadership of which does not want to destroy the U.S. economy if it doesn't get its way on the ACA. But members of the suicide caucus apparently do. Here's the Republican Party's problem, in two sentences: It would be a disaster for the party to shut down the government over Obamacare. But it's good for every individual Republican politician to support shutting down the government over Obamacare. In case you are wondering, Mike Kelly is not a member of the suicide caucus. That may surprise some -- or all -- of you, but Fallows defines the caucus around a letter sent by House members to House Speaker John Boehner, pretty much calling for the defunding of the ACA at any cost. Those that signed the letter Fallows considers suicide caucus members. Mike Kelly did not sign the letter. Despite some indications that Kelly shouldn't be counted out of the suicide caucus -- his position on food stamps, say, or his creepy opposition to a recent UN arms trade agreement (based on completely bogus arguments) -- show him to look more like a conspiracy-obsessed nutter than a reasonable lawmaker looking out for his district. This is a man, after all, that failed to draft party legislation trimming $380 million from the budget because he was distracted by "Fast and Furious" and "Benghazi," two of the odder conservative conspiracy theories you'll see. But, Kelly was one of the House Republicans that shifted his vote in the last debt-celing crisis. Bucking the Tea Party, Kelly eventually did do the right thing and voted to raise the debt ceiling. And if we're going to come out of this most recent legislative crisis with an economy, he'll have to do it again.